Just as in many other parts of the world, women are often denied equal treatment and equal rights in Latin America. Once again, the extent of this issue varies hugely across the region, and takes many forms – from limited access to pre- and post-natal care, to gender-based violence and femicide. All too often, women are forced to bear the brunt of poverty, and gender inequality is high throughout the region. Latin American women often find themselves effectively locked out of employment opportunities, and are twice as likely as men to be unpaid workers. For many women, basic security and protection from harm is little more than wishful thinking. Out of the 10 countries worldwide with the highest rates of female murder victims, seven are located in Latin America. 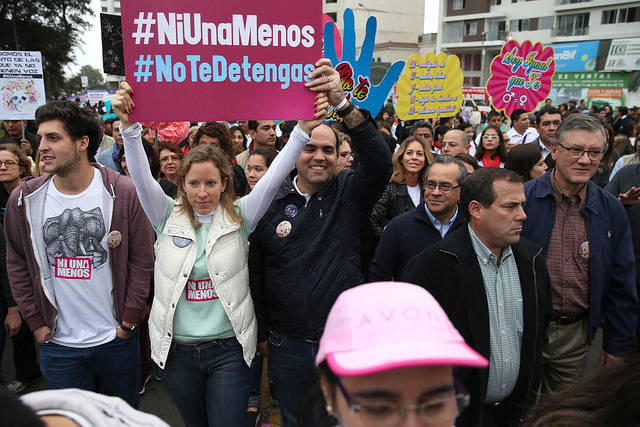 People fill the streets of Lima, Peru to protest violence against women. Photo by Luis Ruiz / Prensa Minedu. Throughout our work, LASC has always striven to include and celebrate female perspectives and experiences. We have facilitated talks, debates and discussions on these issues to help bring greater awareness to people in Ireland of these issues. Women have often been a key feature in many vibrant social movements throughout the Americas, and a huge source of inspiration for LASC. From the iconic protests of Argentina’s Madres de la Plaza de Mayo, who search for answers and justice for their disappeared loved ones, to Central America’s Caravana de Madres, who seek to reunite families separated by migration, women have contributed hugely to so many important struggles. LASC also expresses its grave concern at the use of violence against women, as exemplified in the epidemic of violence in Ciudad Juarez, and offers its support to all those fighting against it, particularly to the on-going Ni una menos campaigns.